Pivotal and substantial. 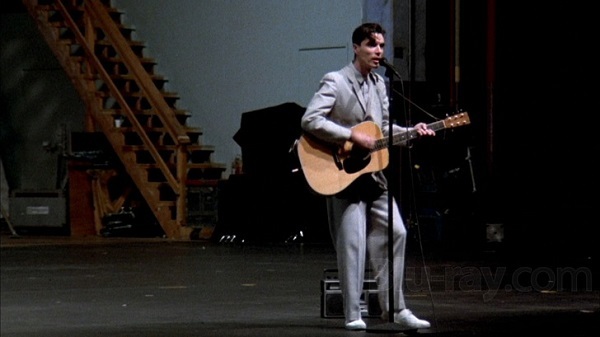 Over thirty years on, Jonathan Demme’s Talking Heads concert film continues to gain traction as one of the best music films of all time. Shot over the course of three nights at Hollywood’s Pantages Theatre in December 1983, it is notable as the first film to be shot using digital audio techniques. It also captures a band at the peak of their powers. And it all starts quite innocuously. David Byrne emerges alone. Guitar in tow, tape deck in hand. He walks up to the mic. Placing a ghetto blaster on the floor by his feet, he utters ‘Hi, I’ve got a tape I want to play you’ and, with raggedy acoustic guitar chops, he accompanies a syncopated backing track. The song in question is their signature (debut) hit ’Psycho Killer’, and it echoes sonorously around the concert hall. Byrne, all strained vocals and incantation, pitches a ‘Qu’est-ce que c’est?’ at the audience. Utterly captivating, this particular version would make Ed Sheeran green-eyed of the one-man musical potency. Leading with this intimacy, gradually, one-by-one, core members and auxiliary live touring performers take to the stage. The sound swells; the choreography evolves. By the end, we have a full stage and Byrne attired (and quite possibly ‘tired’ too) in a huge, giant suit about 5 sizes too big for him (before even he has to wave the white flag and strip down to his shirt). The corners of their catalogue are raided and, alongside such ubiquitous hits as ‘Burning Down The House’ and ‘Once In A Lifetime’, there is space for the funky wails of ‘Life During Wartime’ and ‘Girlfriend Is Better’. In truth, there are many highlights. Lithe and loose shapes are thrown, shadow and shade are used evocatively. But the key question is: why should we be excited about this reissue? Well, it’s been spruced up, restored and newly preserved. Over 60,000 incidences of dirt and scratches have been removed from the original film. The sound too is a something to behold; thumping out of the speakers with crystal clear clarity. Above all, for the uninitiated, Stop Making Sense still reverberates with the power to turn a non-Talking Heads believer into a disciple. It has conversion power. Whilst Silence of the Lambs director Demme has done well since with music films - his trilogy with Neil Young bears testament to that (inc Heart of Gold, and the still-unreleased-in-the-UK, Trunk Show) - but this first effort surely stands tall(est?). As for the Talking Heads, they remain one of the most significant bands of the post-punk era, melding a concoction of styles, genres to their own glorious whole. Stop Making Sense exhibits this efficacy to an undeniable degree. Stop Making Sense is out now on DVD and Blu Ray. You can purchase your copy here.